After an unpleasant encounter with a rat, Mr. Thompson assigns April to research the growing rat infestation happening in the City. April heads for the sewers and, after turning up nothing, decides to return to Channel Six News to meet her deadline. However, she and Irma are forced to head back to work on foot after all four tires of the Channel Six News van have been chewed by rats. Suddenly, they are being pursued by an army of rats and escape on a passing city bus. Back at Channel Six News, in the middle of April’s editorial, the lights go out. When they come back on April is gone. The Turtles, who were watching April on TV in their secret lair, spring into action to locate their missing friend. Meanwhile, April’s abductor introduces himself as the Rat King and that the city’s rat population are his loyal followers. He plans to form a new government – a “Ratocracy,” if you will. April wastes no time telling him what a fruitcake she thinks he is and that her friends, the Turtles, will stop him. The Rat King tells her that mere turtles are no match for his army of rats. That’s when April makes the mistake of telling the Rat King that The Turtles are led by Splinter, who is a rat. Elsewhere in the city’s sewer system, Splinter and the Turtles continue their search, aided by information supplied by Irma regarding April’s abductor. Along the way, Splinter begins to suffer from a series of bouts of momentary confusion. Suddenly, the Rat King appears. After playing a little music, he commands Splinter to destroy the Turtles. Splinter readily complies! The Turtles take a serious beating at the hands of Splinter before they are able to break the spell that binds Splinter to the Rat King. Thanks to a broken water main, the Turtles are able to escape with their very confused sensei. Back at their lair, Splinter confesses his shame for not having enough will power to fight off the Rat King. He begs off his participation in the search for April until he regains his strength. Back at Channel Six News, Irma reviews footage from old new stories and uncovers what she believes to be the hideout of the Rat King. She ventures down into the sewers with Vernon, who beats feet at the first sign of a rat – which happens to be a stuffed animal that looks more like Mickey Mouse. Meanwhile, April is able to escape and reunite herself with the Turtles just as the Rat King discovers Irma. 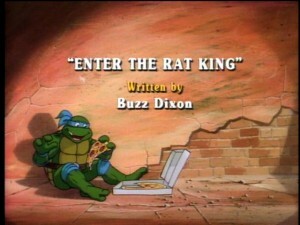 The Rat King then uses Irma to lure April and the Turtles into a trap. In the eventual struggle, one of the Rat King’s explosive devices drops onto the sewer floor, causing everyone to scatter, thus allowing the Rat King to escape. Back at the Turtles’ lair, Splinter assures his students that they have not seen the last of the Rat King.